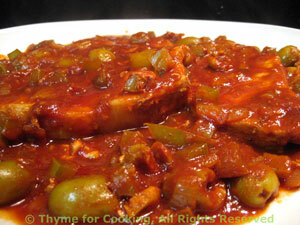 Braised Pork Chops with Peppers and Olives, easy gourmet dinner for the weekend. Rutabagas are in season now and a great winter root vegetable. Try it... you may like it. As they tend to be rather large, there should be enough for 2 meals. 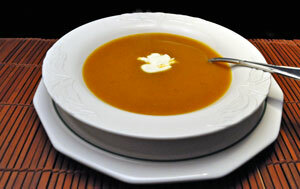 The soup is easy and works well for holiday dinners. 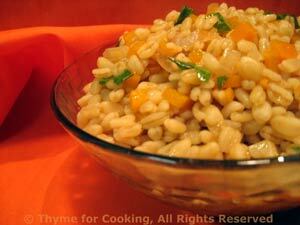 Barley is a hearty, nutritious grain; easy to cook and flavorful. I get the quick-cooking barley which takes 15 minutes. Here it's cooked in chicken stock with sautéed carrots and onion; a pretty, flavorful side dish. Heat oil in a small saucepan. Add onion, carrot and sauté until they start to get tender, about 5 minutes. Add barley, stock, soy sauce, basil and sherry; stir to combine. Cover and simmer until barley is done, about 15 minutes or according to package directions. Roughly chop bacon and sauté in a medium sauce pan. When crisp remove and drain all but 1 tbs fat. Chop onion, add to skillet and sauté until tender, about 5 minutes. 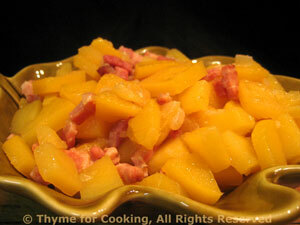 Add rutabaga, 1/2 cup water and bacon. Bring to a boil, cover, reduce heat and simmer 15 - 20 minutes. Test for doneness - taste, should be like a cooked potato. When done, drain any remaining liquid, stir in butter, sherry and serve.